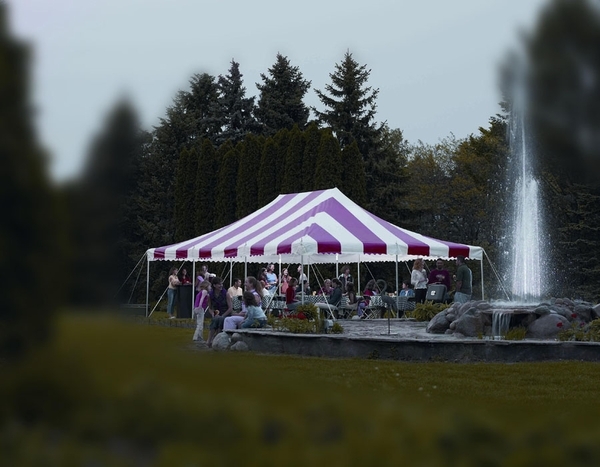 This traditional pole tent is the perfect venue for your next outdoor activity. The tent measures 20' x 20', and features a one-piece 11 oz. translucent vinyl top. The top comes with white, or white with vertical colored stripes. It resists both fire and mildew, and provides approximately 400 square feet of covered space. The side poles are 7', and the sectional center poles are constructed of anodized aluminum for added strength. The tent boasts attached guy ropes, D fittings, reinforced corners and pole positions, and even storm lines at each center pole. This tent is simple to set up with only two people, and includes all the needed poles, stakes, and storage bags. I have a couple of questions for you. We are planning on using this tent indoors at a tradeshow. Is it self standing? Meaning, does it need to be staked to the ground to be stable? Are the side walls included in the product? From the picture it looks like they are not. Are there any side walls available? We're looking for a 20 x 20 tent with a translucent top that we can use for tradeshows indoors with side walls. Do you have an alternative option?